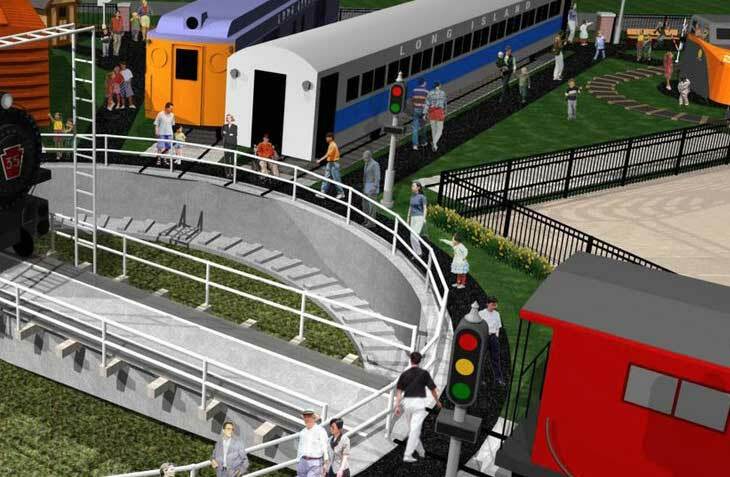 Artist’s rendering of OBRM’s restored turntable with an outdoor exhibit area featuring locomotive #35 and other historic examples of railroad rolling stock. Over 40 people attended on May 8 for a trip on the LIRR to Oyster Bay to visit the current and future locations of the Oyster Bay Railroad Museum. Morning rains gave way to sunny skies before the group’s arrival in Oyster Bay. Lunch was excellent and the museum visits were enjoyed by all. We thank those at New York Railroad Enthusiasts who organized this fine trip. The NY Division of the ERA is pleased to offer its second joint trip with the New York Railroad Enthusiasts (NYRRE). Please join us for a trip to Oyster Bay and a visit to the Oyster Bay Railroad Museum. 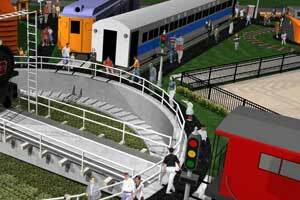 The museum is dedicated to preserving the rich legacy of Long Island’s railroad history. The goal of the museum is to have visitors experience what it was like to work, ride and be a part of life on the railroad. Currently under development, the museum will feature historic railroad buildings and rolling stock, some of which are now on display in the museum’s yard. A turntable is also being restored. The museum’s Downtown Preview Center features interactive, hands-on AV exhibits and a gift shop with railroad-oriented items. We also hope to have a tour of the un-restored Oyster Bay Railroad Station. Lunch will be at Canterbury’s Oyster Bar and Grill. Entrée choices are: horseradish and honey mustard crusted salmon; pan roasted herbal chicken; and pasta primavera with shrimp. Each entrée is served with fresh garden salad with balsamic vinaigrette, and with a dessert choice of key lime pie or chocolate mousse cake, with coffee or tea. Note: one soft drink per person. Alcoholic drinks are optional and on your own. The ticket price of $40 per person includes round-trip train fare, museum admissions and lunch. Full payment is required with your reservation, which must be submitted no later than April 30, 2010. There is no refund if cancellation is given less than two days before the trip. Note that this joint trip is being run by NYRRE, so order tickets as instructed in the PDF below rather than the usual NYD procedure.